Before you jump to any conclusions about the April 2016 murders in Paradise, Ko Tao will always be one of the go to islands in Thailand. These types of horrific atrocities can and do occur everywhere in the world and Thailand is no exception. However, that should not stop you from visiting this beautiful island. You only have to look at what happened in Cambodia between 1975 and 1979 when millions of people were innocently murdered. Though things are still a little depressed in Cambodia to this day, visitors such as myself continue to take vacations there. So please don't let this island incident dampen your spirits. Paradise is waiting for you to come and enjoy. The tiny island of Ko Tao may appear intent on sitting all alone in the middle of nowhere but alone as it may seem in such a vast ocean, it does, however, form part of a much bigger picture. Known as Turtle Island, this pretty enclave is, in fact, a member of the eighty strong Samui archipelago. It's also the third principal island in the group. This beautiful piece of paradise lies 25 miles (40 kilometres) north-west of Ko Phangan and is best known for its superb scuba diving and rock climbing adventure sports. Not that long ago Turtle Island was colonised by just a few backpackers who had come here to seek somewhere quiet to rest their weary feet, but today as more and more tourists are streaming in, escape from the crowds has become less and less possible. 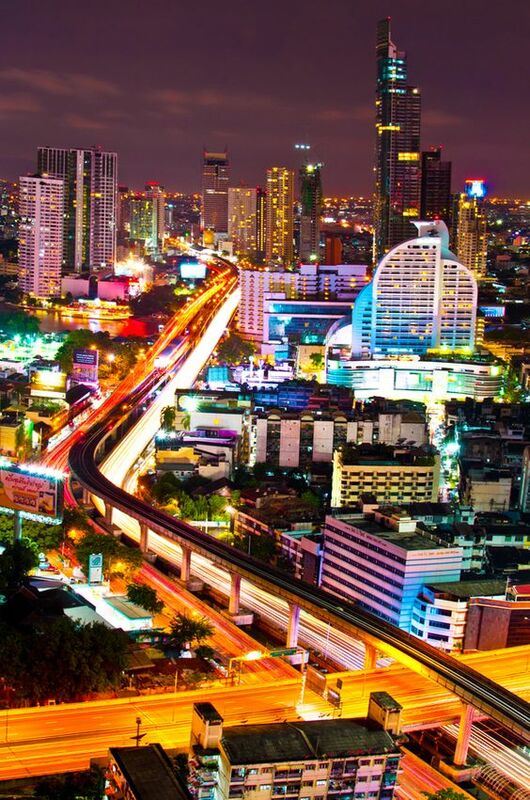 As tourism in Thailand increases, so privacy decreases. Nonetheless, this little corner of paradise still holds a fair amount of fascination and may well be worth a visit should you be in the vicinity. Assess to Ko Tao is by boat only. Ko Tao is so named because its shape resembles that of a turtle. The east coast appears to echo the turtle's rugged shell and is crenellated with several secluded coves. The west coast matches the shape of the turtle's underbelly and has a long curved beach. The south coast mirrors the turtle diving towards Ko Phangan. Incidentally, the chance of spotting a turtle here is rather unlikely. Let me know if you do find one. What you will find here are black-tipped reef sharks. These sharks are normally quite timid and skittish and fearful of humans. As difficult as they are to approach, a black-tip shark seldom poses a danger to humans unless roused by food, so please don't attempt to feed them. This 2-day dive small group tour for certified divers as detailed in the link above includes 4 dives and a one-night accommodation on Koh Tao. It's going to be a spectacular adventure in the "pearl" of the Gulf of Thailand. Ko Tao is one of the best dive locations in the country. On this trip, you'll be able to visit a whole lot of different dive sites around Koh Tao and also the Nang Yuan Islands, such as Chumphon Pinnacle, South-West Pinnacle, Shark island as well as two shipwrecks: HTMS "Sattakut" and M.V. "Trident". You'll be accommodated on a big and comfortable 20-metre dive boat, perfectly situated for diving and snorkelling. There are two decks on the boat, a dive deck with tanks and compressor and a sun deck for chilling between dives. There's also a closed dry area, two freshwater showers and a toilet. 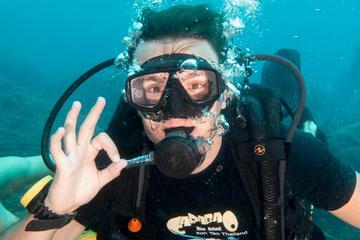 You'll also be accompanied by some very friendly and professional PADI certified dive guides. Most tourists arriving at Ko Tao will either come from Ko Samui or Ko Phangan but there are departure points via the mainland from either Surat Thani or Chumphon. All boats to the island dock at one of the three piers at Ban Mae Hat beachfront. Ban Mae Hat is the only proper village on the island. It's lively, it's pleasant and it's friendly. Perhaps a little too friendly if you get my drift. Long-Tail Touts are here to greet you with a big smile while proclaiming to know the best, but often isolated bungalows for overnight stays, the best beaches and dive sites. Be careful, be mindful and be wary. Touts can be shrewd, slick and sharp. After all, they have been perfecting this particular craft for decades and you as a first timer, are the perfect target. You need to be wide awake here. When confronted with situations such as these, simply smile politely and then just walk away. Simple as it may seem, I know it's not always easy. You need to learn and learn fast otherwise the alternative is to get ripped off. Something that will happen at least once on your trip. I'm getting better at avoiding the suspicious behaviour of touts now. And it's often said that practice makes for perfection, so it's better to avoid these confrontations. Rather than that, go your own way. Nestling in the heart of a pleasant beachfront setting, the amenities at Mae Hat is far greater than the rest of the island and includes a few small supermarkets, a couple of pharmacies a police station and a clinic. The only paved street heads straight up a hill from the main pier and from there, to several narrower streets that run up at right angles and parallel to the seafront. As much as you can get around the 21 square kilometre (8 square miles) island easily on foot, there are a few roads you can take, albeit some of them being little more than rough tracks and really only suitable for four wheel drive type vehicles. Rental agencies hire out mopeds, quad bikes and various all-terrain vehicles should you wish to explore Ko Tao island by road or off-road. As a tip, try to avoid the motorbike rental outfits in front of the main pier at Mae Hat. There have been some rather nasty reports from tourists being exorbitantly overcharged for even the slightest damage done when returning their vehicles. Rather rent from your resort or someone more reliable like the legendary Mr J. Who exactly is Mr J? Well, for starters, he's quite a character and one who makes no bones about erecting a small manufacturing plant to produce his own brand of homemade condoms. Best of all, if you buy ten you'll get one absolutely free. Now here's the thing - According to Mr J. The condoms have a 20-year guarantee. Don't take my word on this, go ask him yourself. I know what you are thinking right now. Do I spread them over a twenty year period and wait to see if his predictions come true or do I take it with a pinch of salt and use them all up before I die or better still, before I leave the small island, whichever one comes (excuse the pun) first. I'll leave you to your own conclusion. In addition to contraception, Mr J. offers other benefits including accommodation in the form of reasonably priced bungalows with or without air-conditioning and a couple of supermarkets packed ceiling high with stacks of books, heaps of clothing, loads of souvenirs, assorted snacks and drinks including beer as well as a frightening display of fireworks. Mr J's businesses form part of a trusted network. One of Mr J's shops lies just south of Mae Hat Pier and another five minutes walk north of the village between Mae Hat and Sai Ree Beach. Here the shop is atop a small hill with Mr J's bungalows nestling down the hill towards a very quiet end of Mae Hat Beach. The beach is only a few minutes away, albeit through a coconut grove littered with trash and the final resting place of several old broken boats. You'll find all the best beaches located on the western and southern shores of Ko Tao. Though it has a pleasant beach, Mae Hat on the west coast is where boats dock to drop off visitors. From there most prefer to explore further afield. Probably the most popular beach is Hat Sai Ree. It's positioned north of Mae Hat just beyond a small promontory. The beach itself is a long classical curve of white sand that stretches for two kilometres and backed up with a sprinkling of coconut palms (see photo below) and around twenty or so bungalow type resorts. Nearby is the popular expat rendezvous called Suthep serving all kinds of western grub such as pizza, pasta, a variety of vegetarian food as well as tasty Thai cuisine. A great spot to just chill over a sundowner while waiting for the beach parties to come alive are the beach tables in the adjacent Dry Bar. The parties mostly happen on Friday nights, but you never know what may come next. Parties are mandatory across many of the islands here, but perhaps more so on Ko Phangan. Running up from the back of the beach is a narrow paved track that takes you to the village of Ban Hat Sai Ree, a thriving village of travel agencies, supermarkets, and internet cafes. The stylish New Heaven Deli and Bakery on the southern side of the island are tops for lovers of pastries. This is the where you'll get great home-baked bread and cakes as well as pies, sandwiches, salads and shakes. The southern region of Ko Tao Island has several attractions, one of which is Freedom Beach, an idyllic white sandy patch carved out of the Laem Tato headland. It is secluded, it is palm-lined and it is beautiful. From there you'll find a path leading up to a steep hillside named John-Suwan Mountain Viewpoint. This is where the views take on a whole new meaning. The best time to go would be just before sunset. The neighbouring bays of Chalok Ban Kao and Thian Ok as well as Ko Samui Island, Ko Phangan Island and Shark Island, are all within sight. There are over 25 scuba diving and open water diving sites in and around Ko Tao of which I have listed about ten of the main sites. They are not in any particular order of preference, but just for the record, there are about 50 dive companies to meet your demand, thus making it the largest dive training centre not only in Thailand but also in the whole of South East Asia. Most are based in Mae Hat, Hat Sai Ree and Ao Chalok Ban Kao and staffed by westerners. It's best to inquire which of these would suit you once you are here. To the north of Ko Tao, there are the three tiny islands of Ko Nang Yuan, which among them, are surrounded by a variety of diving sites suitable for everyone. The shore here sports an assortment of soft and hard coral filled with ample sea life. There are giant granite boulders with swim-throughs, caves and canyons where you might spot a moray stingray or perhaps an occasional reef shark. Also between the islands of Ko Nang Yuan and Hat Sai Ree beach is White Rock, so named because the granite boulders seen from the surface have turned white from the sarcophyton leather coral. The surface is made up of wire antipatharian and colourful soft coral and gorgonian sea fans that overflow with marine sea life, including that of titan triggerfish, butterfly fish, angelfish, clown fish and morays. To the south of Ko Tao lies Shark Island, so named because of the leopard and reef sharks and the occasional whale shark seen in the waters around here. The bay area is smothered in large granite boulders with Acropora, wire and bushy antipatharian corals, sea whips, gorgonian sea fans and barrel sponges. Apart from the resident turtle seen here, you will see titan triggerfish, angelfish and the odd barracuda. If you are the kind of person who loves to go scuba diving you'll already know how magical the underwater world can be. That's especially true in places like Koh Tao. So come and experience the joy of diving off the coast of this beautiful island. 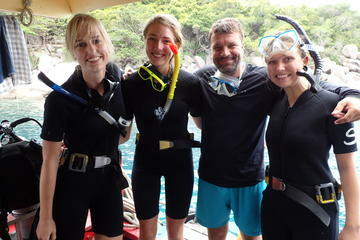 The world-class instructors on this exploration as shown in the link above will guide you in your underwater venture. To give you some perspective on what to expect on this sub-aquatic journey, you'll be surrounded by schools of tropical fish. Moray eel, blue spotted stingray, seahorses and turtles can commonly be seen around this island. Did I just say turtles. Well, you may or may not spot one but what the heck, you'll still get to see plenty more sea life here. 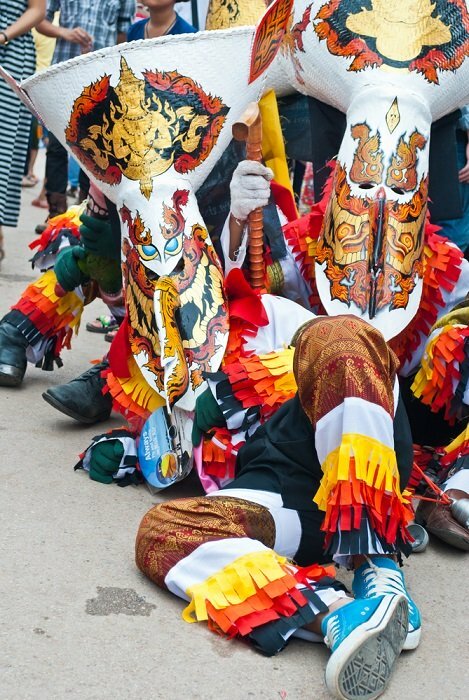 Orientation and equipment are all provided for you to go out there and just enjoy yourself. If you are an experienced diver, try the dive site at Hinwong Pinnacle, just off the northeastern shores of Ko Tao. The scenery here is similar to that of White Rock but over a much larger area. However, you need to be a little more mindful as the currents can get fairly strong at the best of times. At a depth of around 30 metres, you'll find lovely soft coral and a wide range of marine life which include puffer-fish, box-fish, blue-spotted fantail stingrays and hawksbill turtles. You can also try Chumphon or Northwest Pinnacle. The granite pinnacle here starts at 14 metres underwater and then drops off sharply to around 36 metres. Its top is covered with big beautiful anemones while being surrounded by several smaller formations. Even at this depth, there's a very good possibility that the visibility will be exceptional. Deeper down there are antipatharian corals, barrel sponges and a wide variety of fish in large quantities. Local fishermen also come here to catch barracuda, batfish and giant groupers. One of the top sites in terms of scenery, marine life and visibility for experienced divers is at Southwest Pinnacle. The principal pyramid-like pinnacle here rises 6 metres below the surface. It's covered in anemones with few minor ones sporting several more modest formations. At lower levels granite boulders, barrel sponges, sea whips, tree and bush antipatharian corals can be seen. A variety of fish life can be found including giant groupers, snappers and barracuda. Leopard sharks, sand sharks, whale sharks, finback whales and large rays are sometimes seen. Midway between the islands of Ko Tao and Ko Phangan in the Gulf of Thailand is Sail Rock or Hin Bai. The granite pinnacle you see here rises 15 metres above the surface of the sea with a further 40 metres below the surface, 30 metres of which has good viability. It is considered one of the premier dive sites because of its famous ten metre vertical underwater chimney swim-through. Here you can enter either at six metres and exit at eighteen metres or the other way round. Snappers, large grouper fish, blue-ringed angle fish, bat fish, king fish, chevron barracuda, tuna and juvenile clown sweetlips are just some of the fish life here. Occasionally manta rays can be spotted or perhaps even the odd whale shark.